Morse was constructed in 1956 as a water source for the City of Indianapolis. The lake has 1500 acres of water, 35 miles of shoreline and 7 mi of navigable water. Although we often refer to it as Morse Lake, Morse is technically a reservoir. Because it is a reservoir, water levels can fluctuate by 4′ or more. 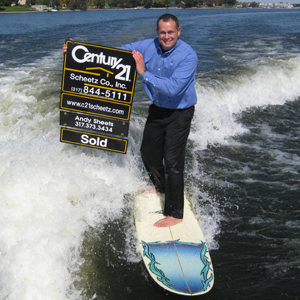 DO NOT buy a house on the lake without a REALTOR who is familiar with the lake/reservoir! If you do your homework, the water levels will not be an issue. The lake has 1 boat ramp which is located at the Morse Lake Marina. There are 3 restaurant options on Morse! Harbour Trees Golf & Beach Club – Located in North Harbour. Membership required to dine. Harbour Trees Golf & Beach Club features a lakeside beach club with pool, tennis courts, workout facility, bar, restaurant & snack bar. A exceptional facility like no other in the state! Dock parking available! The lake is divided by 2 school districts. South –Noblesville Schools and North –Hamilton Heights. Noblesville offers just about anything you could possibly need in terms of ammenities – from all of the big box stores (Best Buy, Walmart, Meijer) to a vibrant & quaint downtown square offering locally owned restaurants, shops & businesses. Downtown Indianapolis is only a 30-45 minute drive from Morse. The Morse Waterways Association is a non-profit organization dedicated to keeping Morse clean, safe & enjoyable for residents and boaters! I offer real estate boat tours of Morse Lake for my clients interested in a lake house, but not familiar with the lake. Learn about idle zones, shallow spots, parks, restaurants, etc.. Give me a call (317-373-3434) or drop me an email (andy.sheets@century21.com) to schedule! I’ll never pass up the opportunity to go out on the boat!